VPS without control panel makes a new users scarred with the only black command line option. But this is the best way and you will master to use it very fast. First, we are considering Cloud VPS mainly as they are on Pay as You Go model – like Rackspace Unmanaged Cloud Server, if you can not control the test server or have messed it up, simply delete it – no fixed monthly cost, only the usage cost makes them ideal for learning purpose. VPS without control panel means it has only the Operating System, that is some version of Linux installed on it. This is good. VPS Without Control Panel : Why the Hell Only a Black Screen Option ? On server, we usually use the Server Version of the Operating System. Practically that is nothing but your Desktop Operating System minus the Graphical User Interface (GUI). The ‘engine’ is actually the same, that is also a computer plus OS. If you are seeking to find the differences, you can read our article on server operating system versus desktop operating system. First, you will never use the GUI 24 x 7 x 365 , it will run and use lot of resources for the daemons (=processes) those are not required. Essentially, a GUI enabled Server will require 1 GB RAM where 512 MB was enough for a CLI only server. This is approximate calculation. Secondly, the security loopholes get exposed. For the same second reason, we use a different protocol, there are various protocols like you are using http for browsing this website. This protocol is named Secure Shell or SSH. Instead of clicking, you will send commands by typing. All Control Panel adds no extra function other than adding burden, security risk to the server for a server. These daemons, packages runs when you will never ever use them. Still, if you want a control panel, you can use Free Control Panel named Open Panel. Without control panel practically we can visually work with a FTP software and PHPMyAdmin (for MySQL database). So, basically you can view your website’s things graphically. Where is the need for an extra junk ? Will you add domains everyday ? A server is like renting a house. You must know the bare minimum about Linux commands, security etcetera. New users are not informed and made fool by medium sized web hosting companies by promoting “cPanel Hosting” like phrases. Even a VPS is costly option for you, today there are lot of Platform as a Service providers who provides Free quota – RedHat OpenShift, Heroku, AppFog are few examples. We have full guides on them too, just search within our website if you need. Will you ever buy a computer that is manufactured by an unknown company ? Check Wikipedia for the company’s fame, establishment – bigger will have public shares. Yes, you will need more days to learn, but it will be solid knowledge, just like you do a bit research on paints while going for a painting job for your house. This Article Has Been Shared 7152 Times! Any kind of help would be really appreciated! Appreciate it! 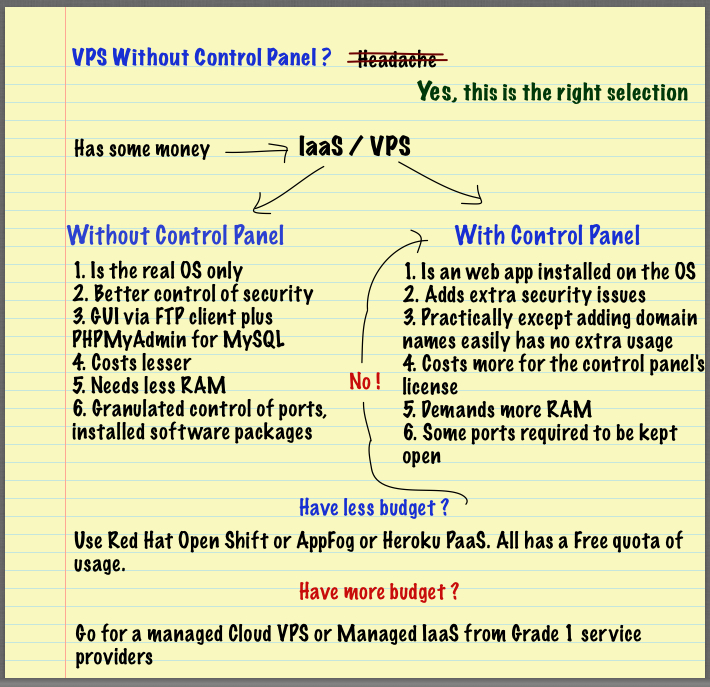 Cite this article as: Abhishek Ghosh, "VPS Without Control Panel : All the Needed Info," in The Customize Windows, August 7, 2013, April 25, 2019, https://thecustomizewindows.com/2013/08/vps-without-control-panel-all-the-needed-info/.